Seated but immense, with his eyes closed in meditation and reflection, the giant, austere statues of the Great Buddha look over a population of adherents that stretches from Indonesia to Russia and from Japan to the Middle East. His gentle philosophy also appeals to many believers scattered all over the world. Somewhere between 500 million and 1 billion people worldwide are estimated to be Buddhists. It’s exactly the nebulous nature of Buddha’s philosophy, crisscrossed by many sects of adherents with a dizzying assortment of beliefs and approaches to the faith, that makes it so difficult to estimate exactly how many Buddhists there are. Some scholars go so far as to refuse to define Buddhism as a religion at all, and prefer to refer to it as a personal philosophy, a way of life, rather than a true theology. Two and a half centuries ago, a boy named Siddhartha Gautama was born into a royal family in a rural backwater in the northeast corner of the Indian subcontinent, in modern-day Nepal. An astrologer told the boy’s father, King Suddhodana, that when the child grew he would either become a king or a monk depending on his experience in the world. Intent on forcing the issue, Siddhartha’s father never let him see the world outside the walls of the palace, a virtual prisoner until he was 29 years old. When he finally ventured forth into the real world, he was touched by the suffering of the ordinary people he encountered. Siddhartha dedicated his life to ascetic contemplation until he achieved “enlightenment,” a feeling of inner peace and wisdom, and adopted the title of “Buddha.” For over forty years he crisscrossed India on foot to spread his Dharma, a set of guidelines or laws for behaviors for his followers. 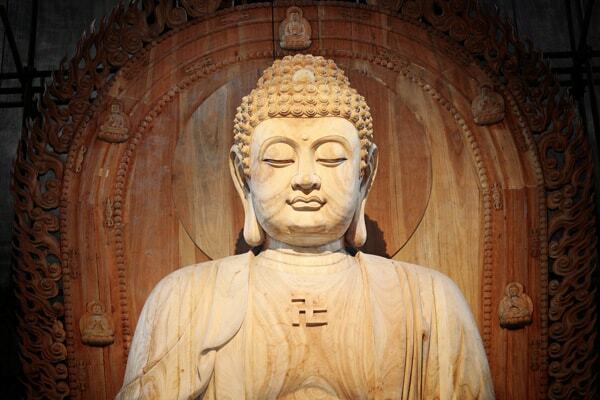 When Buddha died in 483 BC, his religion was already prominent throughout central India. His word was spread by monks seeking to becomearhats, or holy men. Arhats believed they could reach Nirvana, or perfect peace, in this lifetime by living an ascetic life of contemplation. Monasteries dedicated to the memory of Buddha and his teachings became prominent in large Indian cities like Vaishali, Shravasti, and Rajagriha. Shortly after Buddha’s death, his most prominent disciple called a meeting of five hundred Buddhist monks. At this assembly, all of Buddha’s teachings, or sutras, as well as all the rules Buddha had set down for life in his monasteries, were read aloud to the congregation. All of this information together forms the core of Buddhist scripture to this day. With a defined way of life outlined for all his disciples, Buddhism spread throughout the rest of India. Differences in interpretation crept in as the number of adherents grew distant from each other. One hundred years after the first great assembly, another was convened to try to iron out their differences, with little unity but no animosity, either. By the third century BC, eighteen separate schools of Buddhist thought were at work in India, but all the separate schools recognized each other as fellow adherents of Buddha’s philosophy. A third council was convened in the third century BC, and a sect of the Buddhist called the Sarvastivadins migrated west and established a home in the city of Mathura. Over the intervening centuries their disciples have dominated religious thought throughout much of central Asia and Kashmir. Their descendants form the core of the current-day schools of Tibetan Buddhism. Over the centuries, Buddhist thought continued to spread and splinter, with innumerable changes added to its scriptures by a multitude of authors. During the three centuries of the Gupta period, Buddhism reigned supreme and unchallenged throughout India. But then, in the sixth century, invading hordes of Huns raged across India and destroyed hundreds of Buddhist monasteries. The Huns were opposed by a series of kings that defended the Buddhists and their monasteries, and for four hundred years the Buddhists thrived once again in northeastern India. During the Middle Ages, a great, muscular religion appeared from the deserts of the Middle East to challenge Buddhism. Islam spread quickly east, and by the late Middle Ages Buddhism was wiped almost completely from the map of India. It was the end of the expansion of Buddhism. Buddhism today is represented by three main strains that cover distinct geographical areas. Since Buddhist thought is more of a personal philosophy than a well-defined creed, it has always invited an enormous multitude of interpretations. This continual churning of thought in Buddhist thought continues into the present day with contemporary Buddhist movements with names like Neo-Buddhism, Engaged Buddhism, and an array of truly tiny, and sometimes, literally individual traditions in the West. In the latter half of the 20th century, a movement of Japanese Buddhists calling themselves the Value Creation Society sprang up and spread to neighboring countries. The members of this Soka Gakkai movement are not monks, but consist solely of lay members interpreting and meditating on Buddha’s legacy on their own, centuries after Siddhartha first stepped foot outside his palace walls and looked on the world that he felt need his call for peace, contemplation, and harmony.